The faster your life, the better a slow cooker looks. Slow cookers are useful for busy people: you fill the bowl with ingredients, switch it on and leave it to do its thing. We’ve tested a range of models, including some multi-cookers which can also pressure cook. Snapshot: The Russell Hobbs Slow Cooker 4443BSS’s capacity is a small 3.5L. How easy is it to use and how well does it cook? Snapshot: The Cuisinart 3 in 1 Multi-Cooker MSC-600A’s capacity is a medium 5.7L. How easy is it to use and how well does it cook? Snapshot: The Home & Co 3L Slow Cooker Black SA-SC-1235 has a capacity of 3L. How easy is it to use and how well does it cook? Snapshot: The Cuisinart Programmable Slow Cooker PSC-400A’s capacity is small 4L. How easy is it to use and how well does it cook? Snapshot: The Home & Co 5L Slow Cooker XJ-13220B has a 5L stated capacity. How easy is it to use and how well does it cook? 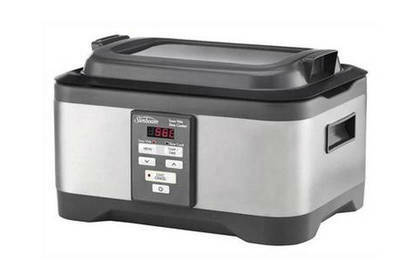 Snapshot: The Maxim 6.5L Slow Cooker NSC-650 has a 6.5L stated capacity. How easy is it to use and how well does it cook? 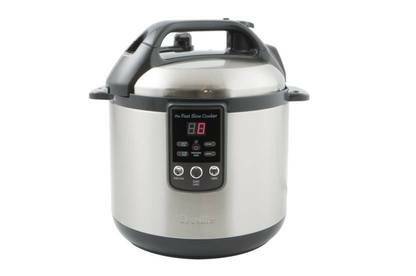 Snapshot: The Cuisinart 6.5L Slow Cooker PSC-650A’s capacity is a large 6.5L. How easy is it to use and how well does it cook? Snapshot: The Russell Hobbs 6L Searing Slow Cooker RHSC650’s capacity is a large 6L. How easy is it to use and how well does it cook? Snapshot: The KitchenAid Artisan Slow Cooker KSC6222’s capacity is a medium 5.7L. How easy is it to use and how well does it cook? Snapshot: The Cuisinart CPC-610A Pressure Cooker Plus is a multi-cooker with a large 6L capacity. How easy is it to use and how well does it cook? Snapshot: The Zip Elegance 5L Slow Cooker 223’s capacity is a medium-sized 5L. How easy is it to use and how well does it cook? Snapshot: The Crock-Pot Lift & Serve Slow Cooker CHP450 has a capacity of 5.7L. How easy is it to use and how well does it cook? Consider these features when you're choosing a slow cooker. Get the right size: a 5 to 6 litre cooker gives a useable volume of 4 litres — a good size for large groups. For 1 or 2 people, 3.5 litres (2 litres useable volume) is enough. 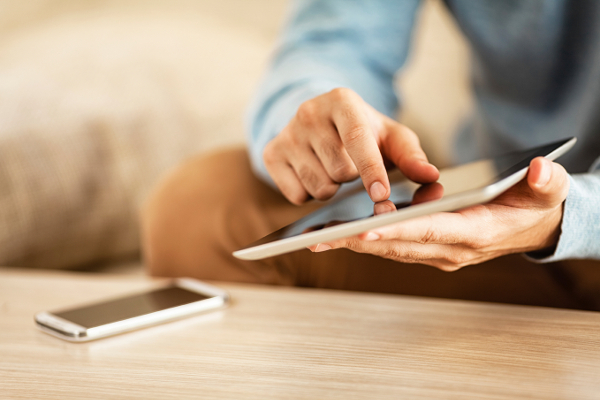 Make checking easy: a glass lid allows you to check progress without lifting the lid. Slow cookers plus: Some slow cookers can also steam, cook rice, bake or even make yoghurt. Get the most convenient shape: a round pot is fine if you plan to cook only stews and curries, but an oval cooker allows you to cook longer cuts of meat such as lamb shanks or roasts as well. Searing in the juices: Slow cookers produce moisture as they cook, which means sauces can end up watery and lacking flavour. Slow cookers with non-stick metal pans or a built-in searing feature allow you to brown the meat (which produces better flavours) before the slow cooking starts. And at the end of cooking you can turn up the heat or transfer the pan to the stovetop to reduce the liquid and concentrate the flavours — all without creating extra dirty dishes. You’ll pay more for this feature, but you’ll get a more versatile appliance. Here's what the settings on a slow cooker are used for. Low gently simmers food for a long time. High cooks over a shorter time, although the food may need stirring to improve the flavour and you may have to add water. Warm is for keeping the food at serving temperature – but you shouldn't use this setting for more than 4 hours. Auto cooks food on "high" for a while, then switches to "low". Fast cook, slow cook, sear and steam. Versatile multi-cookers do it all. In our test kitchen to be classified as a multi-cooker, a product must be able to pressure cook as well as slow cook. The pressure-cooking function uses pressure to tenderise the meat so you’ll get a dish that’s usually slow-cooked done double quick. They also double-up as a rice cooker. Steam: perfect for cooking fish and vegetables. Warm: keeps the food warm after the cooking time is finished – great for families who eat at different times. Pressure settings: more than one setting allows you to adjust the time it takes to cook different dishes. The higher the pressure, the quicker the cooking time. Pressure-release valve: a valve you can turn to release steam. It means you don’t have to bother cooling the cooker before you open it. Pressure-regulator valve: controls the rate at which steam vents out of the cooker and the degree of pressure inside the cooker. We found all the tested models fiddly to clean, with areas where food particles can get trapped. None of the cooking bowls have handles (which makes it difficult to stir food or remove the bowl without using an oven mitt). They all take up lots of room in your kitchen cupboard. Check the pressure-release valve to make sure it’s free of food residue before and after each use. Remove and clean the silicone rubber seal regularly – soak the seal in baking soda and water to remove odours. Store the lid upside-down on the pot so the gasket doesn’t lose its shape. Use a tea towel or oven mitt to protect your hands when you open the pressure-release valve. Don’t overfill when using the pressure cooker setting – the cookers usually come with a maximum fill line for liquid and you only need a small amount of water to fill the cooker with steam. Practice makes perfect! We found it takes trial and error to get the cooking times right, even with the recipe books and instructions provided by the manufacturer. Slow cookers cook food at a low enough temperature to be left unattended for hours. But the food must reach a core temperature of at least 60°C to kill harmful bacteria. All the cookers will produce food that's safe to eat – provided you follow both the cooker's instructions and standard food-safety practices. Boil dried beans for at least 10 minutes before slow cooking to destroy toxins which will otherwise survive the lower temperatures of a slow cooker. Always completely thaw frozen meat, poultry or vegetables before putting them in the cooker. Vegetables cook the slowest, so place them at the bottom and sides of the pot and then add the meat. 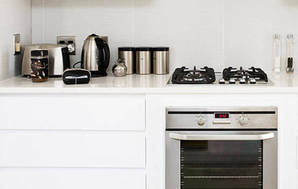 Don't overload the cooker – fill it to about half its capacity (two-thirds at most). Don't take off the lid during cooking unless the recipe calls for it. Removing the lid lets heat and moisture escape, so you will have to extend the cooking time. Add any dairy products, fish or seafood when you get home – or within the last half-hour of cooking. Don't leave cooked food to cool down completely in the bowl or pan. It should cool at room temperature for 2 hours and then go into the fridge. Never reheat leftovers in your slow cooker – use a microwave, cooktop, or oven. If there's a power cut while you're out, check the temperature of the food with a meat thermometer. If it's lower than 70°C, it's probably not safe to eat. The exteriors of slow cookers get hot enough to burn if you touch them while they’re cooking – we've measured temperatures of up to 80°C on the “high” setting. We'd like to see slow cookers better insulated. Not only will this reduce the “burn” risk; it’ll also lower a cooker’s energy consumption. This slow cooker recipe serves 4 to 6. *Slow cookers don’t reach high enough temperatures to destroy a natural toxin which dried red kidney beans contain. Before using dried red kidney beans in a slow cooker you must first soak them for at least 5 hours then pour away the water and boil them for 10 minutes in fresh water. In a large saucepan, or in a slow cooker pan that can be placed on a stove top, heat the oil on medium-high heat, brown the steak for 5-10 minutes. Remove the meat, add onions and garlic, fry for 5 minutes. Add cayenne pepper, oregano, cumin, coriander and paprika, cook for 1 minute. Pour in beef stock, bring to a gentle boil. Add steak, onion and stock mixture to the slow cooker pan with the fresh chilli, soaked dried beans (if using canned beans add to slow cooker 1 hour before end of cooking time), tomatoes and bay leaves. Stir well to distribute ingredients. Cover and slow-cook until the meat is very tender, 5 hours at the high-heat setting or 8 hours at the low-heat setting. Remove the meat from the slow cooker and gently shred the meat using a fork. Return the shredded meat to the slow cooker and keep warm until ready to serve. Season to taste with salt and pepper, stir in fresh coriander leaves. Serve with rice and a dollop of sour cream. When soaking dried beans soak extra as the unused beans can be portioned into freezer bags and frozen for up to 2 months. Portion into 2 cups per bag. (1 kg dried beans makes approximately 10 cups soaked beans.) They are then ready for soups, stews or casseroles. Jalapeño chilli is very hot. If you want a mild chilli use the long green chillies instead or just one jalapeño chilli . Serve the chilli with corn chips, tacos or tortillas, guacamole and sour cream. Leftovers can be frozen up to 2 months. Once you’ve tried sous vide food, you may never want to cook another way again. Seen on the likes of MasterChef, the "sous vide" method is like giving your food a time- and temperature-controlled spa bath. Anova's Precision Cooker is an easy way for you to do this at home. The Sunbeam Duos Sous Vide MU4000 is 2 appliances in 1 – a sous vide cooker that doubles as a slow cooker. Sous-vide cooking involves sealing food in a vacuum-packed bag and cooking this in a water bath at a precise temperature. The bag makes sure the food’s natural juices, moisture and flavours don’t escape – keeping the food tender. We tested the sous vide by cooking pork chops for 4 hours and a chicken breast, salmon and beetroot for 1 hour. It did a very good job of cooking beetroot: while this was slightly undercooked, it was easy to cut for salads. The sous vide wasn’t so good on the other cooking tasks: the pork chops were slightly chewy and a little dry and the chicken breast was slightly undercooked. The slow cooker test consisted of 2 tasks: shredded chilli beef and beans cooked for 5 hours initially and then for another 2; and corned beef cooked for 8 hours. The corned beef was fairly tender – but even after the extra 2 hours, the chilli beef and beans were still undercooked. You need to be organised to do sous vide. For example it takes about 50 minutes to heat the water from 24°C to 83.5°C. As well, since different foods cook at different temperatures you can’t cook meat and vegetables at the same time. You also need to add some finishing touches afterwards – most meats cooked in the sous vide need a quick sear at the end of cooking to brown and caramelise the outside of the meat. The Duos was easy to fill with water – it needs to be filled to the maximum level so the food sits under the water. The instructions were reasonably comprehensive and included some recipes and a very basic temperature and cooking-time guide. But because sous vide is a new way of cooking we think you need more detail. The Duos was very easy to clean. After using the sous vide you simply tip out the water then wipe dry with a soft cloth. The removable pan and lid are dishwasher-safe but the stainless-steel exterior may require a little more attention. You’ll need to invest in a food sealer to use the sous vide – and, like all bigger appliances, it’ll take up space in your kitchen. 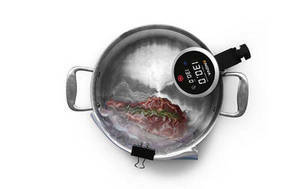 The Duos is reasonably priced for a 2-in-1 appliance that gives you a slow cooker with the bonus of sous-vide cooking. We’ve previously tested the Breville The Sous Vide Supreme. We were impressed by the Breville (giving it 4 stars) but at $1000 it’s not a must-have and doesn’t double as a slow cooker like the Sunbeam. The Sunbeam Duos has a 5.5 litre cooking capacity and comes with a non-stick cooking pan, electronic temperature control and a countdown timer. It also comes with a “pouch rack” that separates the bags for more even cooking. The sous vide has a 40°C to 90°C temperature range (with a 1° increment selection); the slow cooker has low, high and auto “keep warm” settings. If food is cooked or kept in the “temperature danger zone” (5°C to 60°C) for long periods, food-poisoning bacteria can grow. The bacteria has to be there in the first place – which is often the case with chicken. On the other hand if food’s cooked in this temperature zone for short periods, it could be undercooked and not kill the bacteria. To reduce the risk of food poisoning, food that’s cooked sous vide in the “temperature danger zone” should be cooked thoroughly – but it shouldn’t be cooked (or kept warm) for more than 6 hours. As well, any pieces of meat should be the same size and weight. Sunbeam doesn’t recommend sous-vide cooking for pregnant women, small children, elderly people, or people who have an immune deficiency.